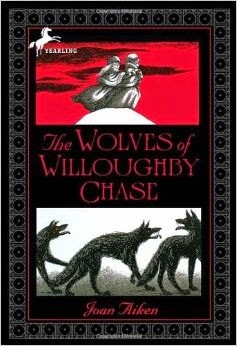 I am so glad that Bluerose chose The Wolves of Willoughby Chase for our book club selection for the month of May. Furthermore, I'm glad I read it! Such a fun and intriguing read. The Wolves of Willoughby Chase is the first in the series and it tells the story of cousins Bonnie and Sylvia who have been left in the care of a Governess by the name of Miss Slighcarp while Bonnie's parents are traveling overseas to improve her mother's health. Miss Slighcarp is not all she seems and her plans for Bonnie's family estate are quite alarming. After Bonnie's parents leave, Miss Slighcarp fires all of the servants and ships both Bonnie and Sylvia off to a boarding "school" that is run more like a workhouse than a school. The girls are miserable and alone and the book chronicles their journey trying to restore things to rights. The wolves mentioned in the title of the book appear in the first half of the story and then disappear altogether. The wolves surround the family property and are quite aggressive with anyone who might be wandering through the woods. Strangely, Miss Slighcarp is never bothered by these fierce beasts. However, as I say, the wolves do not play a prominent role in the book after the first half so I'm not entirely certain of their purpose or history. I do suspect that if I were to read the rest of the books in this series, I would understand. As it is, they add a creepy and mysterious factor to this particular title but my interest in the book lies in what is happening with Bonnie and Sylvia and not the wolves. The book does have dark, mysterious undertones but nothing too scary. I wasn't certain whether or not I should read the book aloud to my kids because I wasn't familiar with the storyline. Now, having read it, I think my seven and five year old would find this title very exciting if I were to read it aloud to them. I rather regret not having included them in the read. I have zero qualms in handing it over as an independent read and will probably do that shortly. One thing I noticed while reading The Wolves of Willoughby Chase was how Aiken writes this children's story with such skill that it makes it not only exciting for a young reader but intriguing for an older one. I kept thinking that this book could easily have become an adult book if Aiken had added more detail and had let the plot unfold a little slower. I would not have minded some further character development as it would have only added to my love of the story. After I finished reading this, I looked up information about Aiken which I shared last week. One thing of note is that Aiken is said to have been skilled as a writer such that she was able to write for all ages and I find that completely believable. It's easy to tell how she almost reigns herself in a bit to keep the story engaging and interesting for the child reader. Yet the writing is not so dumbed down that it's a drag of a reader for an adult. It's hard to explain but it's very notable when reading. Speaking of reading - I hope that you will eventually give this one a chance if you did not read with us this past month. It is full of mysterious, adventurous fun! Note: this is not the conclusion post. You have until Friday, May 30th to complete this read. Should be fairly easy to accomplish! I'm reading it one and like you, I'm sort of regretting not reading it aloud. There's still time, I guess. :). I'm glad to know it doesn't get scarier.